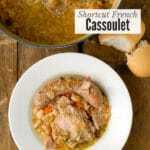 Home » Main Dishes » Shortcut French Cassoulet: a Peasant Stew You’ll Love! Shortcut French Cassoulet: a Peasant Stew You’ll Love! 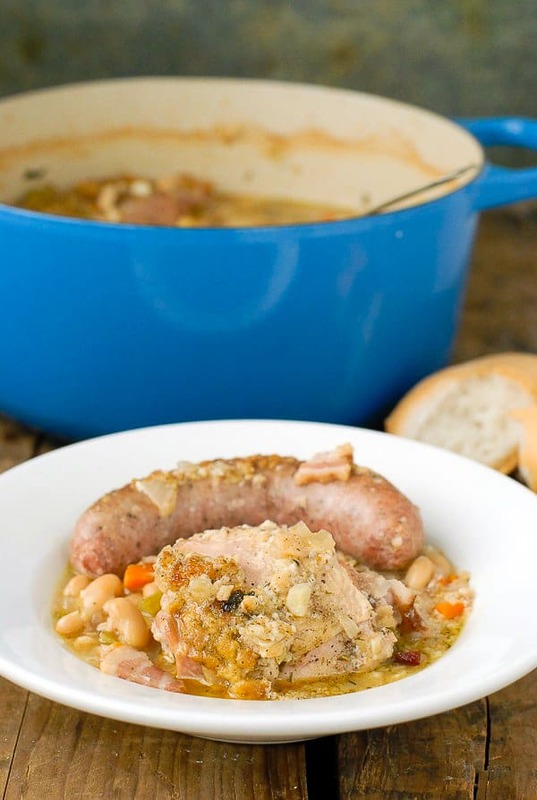 Cassoulet is a French country stew with white beans, chicken, sausage, bacon and vegetables. 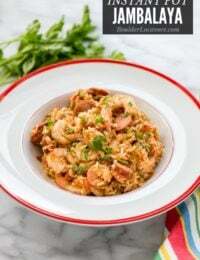 It’s a comfort food recipe you’ll love! Originally published in December 2014; updated September 2018. Cooler weather calls for hearty soul-warming recipes. 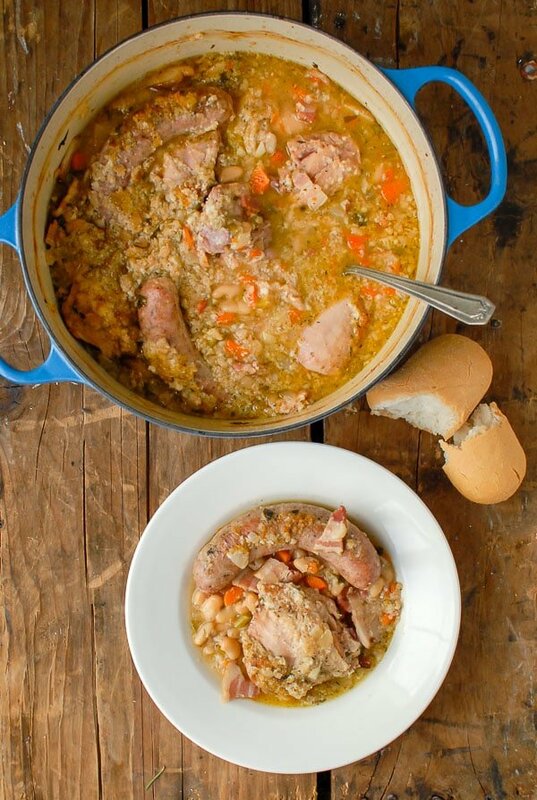 A long time favorite of mine is Cassoulet, a French country stew that’s hearty, relaxed and brimming with great ingredients and flavors. When made traditionally Cassoulet takes three days. I’ve come up with a modified version, staying true to the original flavors but whittling it down to a few hours to make! 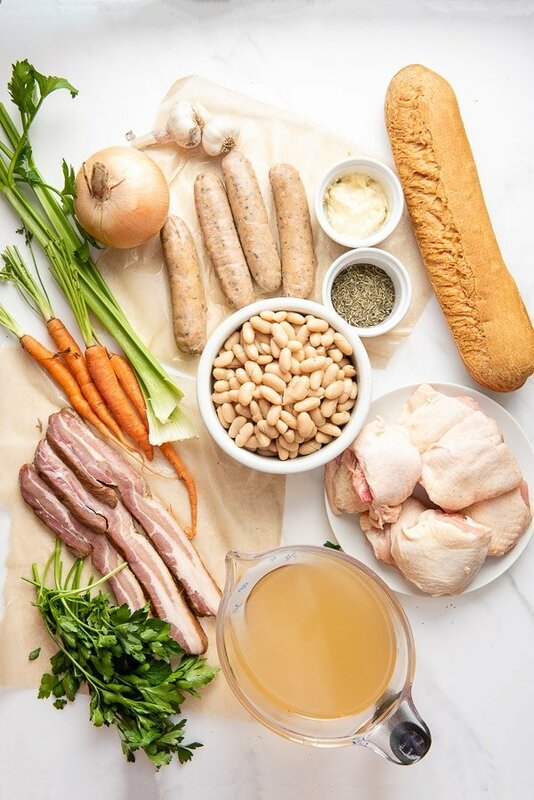 Shortcut French Cassoulet is sure to become a favorite; if not for the flavors and textures, then for the flexibility to change it up with ingredients you love. Cassoulet is an iconic white bean and meat stew, and perhaps the best example of peasant country food. It is said to try the most authentic Cassoulet when in France, do not go to a restaurant but rather have a Farmer’s wife make it for you! 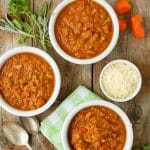 Recipes vary greatly for this dish as it originally was made with what was available however meat, pork and beans are a constant. A traditional cassoulet would include white beans, duck or duck confit, pork, sausages, and/or mutton. However, it was a peasant’s stew, constructed based on availability of ingredients therefore varying readily. Typically, Cassoulet is a long cooking dish often taking days to prepare. 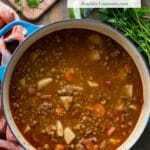 This recipe is a shortcut, staying true to the rustic intentions of the stew but timed for more modern lifestyles when lengthy cooking projects are challenging. 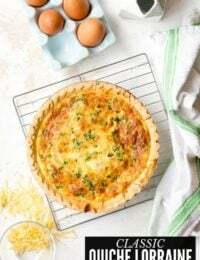 The origins of the dish reside in Southwestern France in the areas of Gascony and Languedoc. When reviewing current day Cassoulet recipes, whether they be from traditional French chefs or chefs with a more contemporary perspective, they also vary wildly. More than a particular ‘recipe’ it is more of a cultural dish. 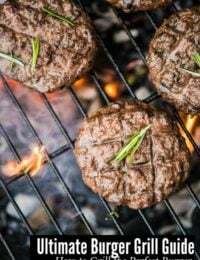 Other than the white beans (which can also vary between traditional Tarbais beans, haricot blanc, to Cannellini), one might find any type of meat as long as there is some pork if not two forms. With the goal of making a Shortcut French Cassoulet I made some modifications to allow enjoying the dish without slaving to make it! To make Cassoulet in a reasonable amount of time I changed up some of the ingredient preparations to creatively meet the flavors of the dish without the time. I was also mindful of using ingredients that were easily available. I used canned beans to bypass the time to cook them from dried form. Browning the meat in duck fat is my nod to the presence of duck however I did not include duck confit which is often traditional (note: butter may also be substituted). Time-Saving Tip: To make the cooking even faster, the vegetables may be prepared the day prior to cooking and stored sealed in the refrigerator until cooking is ready to begin! AND I use a mini chopper to prepare them. Duck fat may be found in gourmet kitchen stores or online. It’s not cheap however. That being said, duck fat can be subsituted anywhere you’ll be sauteeing for a wonderful flavor and it lasts a long time. Butter can be substituted and the cassoulet will be delicious! If you are a duck fan, you can also add some duck instead of the chicken to change the cassoulet up! This recipe is soul-warming with simple, homey flavors. 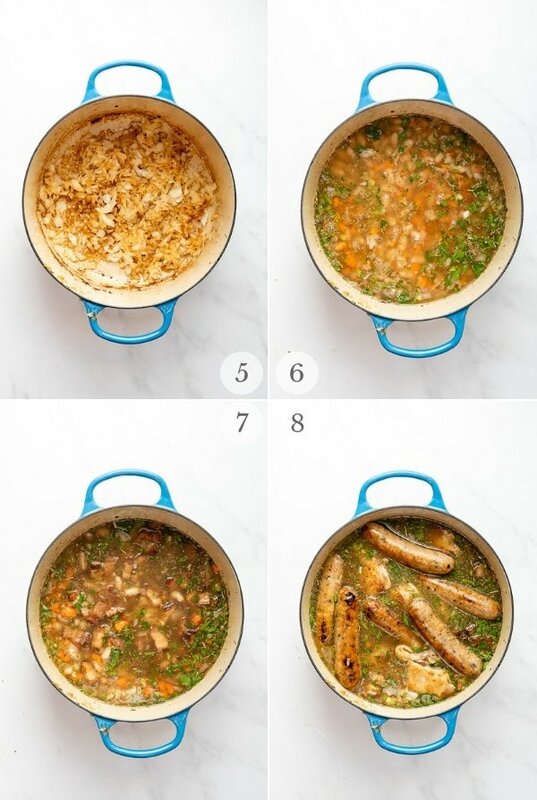 The ease of preparation allows this shortcut Cassoulet to pay homage to the more time-intensive version, and to be more of a mainstream consideration rather than something one saves up days to prepare (though that would be fun too). In a heavy 5 1/2 quart Dutch/French oven, the duck fat or butter is melted. The chicken thighs are placed skin down in the pan to cook for 8 minutes (photo 1 above); then flipped with tongs and cooked 3 minutes longer then removed from the pan (photo 2). Most of the fat is then removed from the pan and onion sauteed (photo 5). The other vegetables,herbs, cannellini beans and chicken stock are added to the pan (photo 6), followed by the bacon (photo 7), chicken and sausages (photo 8). Homemade soft breadcrumbs (see Recipe Notes) are tossed with garlic and added to the top of the stew (this will help thicken the cassoulet too). NOTE: regular or gluten-free bread may be used. The cassoulet is baked for 1 hour 15 minutes. Periodic pressing of the breadcrumb topping into the stew while cooking helps thickening. Finally the cassoulet is broiled to crisp the top. The sausages are cut into 2-inch lengths, added back and the cassoulet is ready! 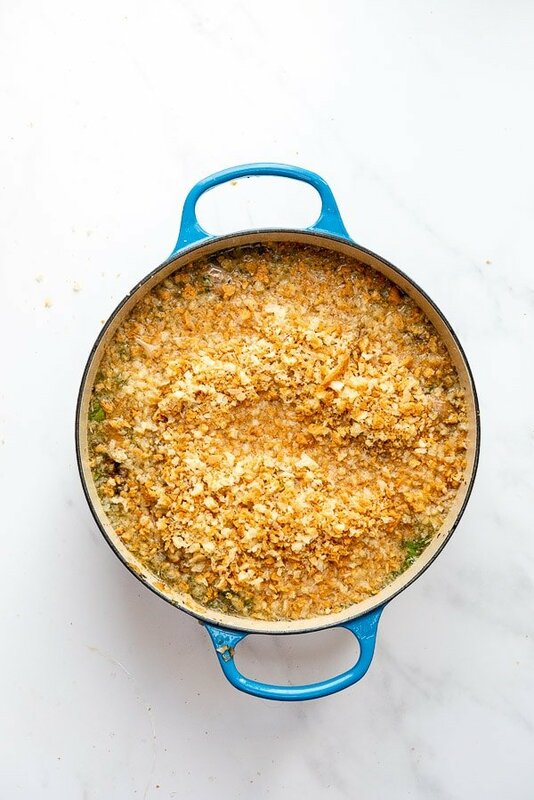 Whether making soft breadcrumbs as used in this cassoulet recipe, or hard breadcrumbs used in many recipes such as meatloaf, meatballs or for breading, they are very easy to make at home. I use my mini chopper for everything. It’s essentially a mini food processor so great for smaller jobs and easy to clean up (pop the vessel in the dishwasher). To make homemade breadcrumbs, fresh bread is used for this cassoulet recipe. I use baguettes (gluten-free for me but regular work if you aren’t gluten-free). Tear off large pieces of the baguette and place into the container of a mini chopper or food processor. Process until large crumbs are created. If making hard breadcrumbs for a different recipe, toast the bread first in a toaster or under the broiler. Let it sit out until it cools and any moisture has dissapated. Then follow these same steps. 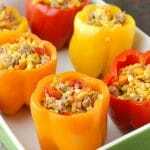 Enjoy more Easy Dinner Recipes! 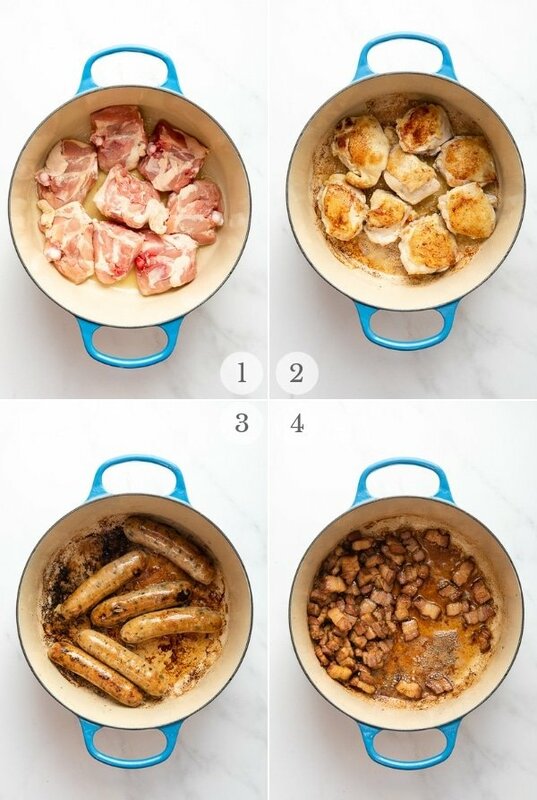 If you’ve tried this Shortcut French Cassoulet recipe please RATE THE RECIPE below! 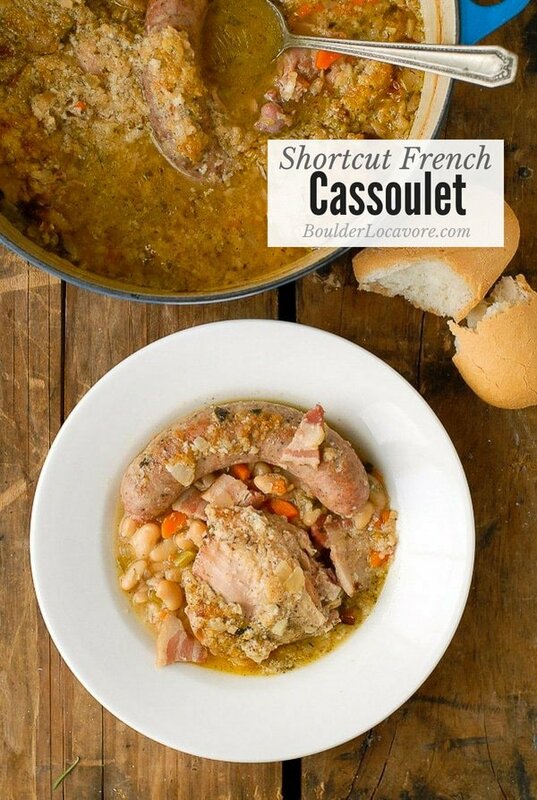 This shortcut Cassoulet takes time out of the making without sacrificing any of the flavor! In a 5 ½ quart (or larger) pot or French/Dutch oven, liquefy the duck fat at medium heat. Place the chicken thighs skin down in the bottom of the pan. Allow to cook for 8 minutes on Medium to Medium High, periodically checking to be sure the skin is not sticking to the pan (if it is gently slide a heat-proof spatula underneath to free the skin). Using heatproof tongs, tune the chicken thighs over and cook for an additional 3 minutes. Remove from pan to a plate; set aside. Add the bacon to the pan. Sauté to render the fat only (about 3 minutes). NOTE: The fat will turn a gray color and be more translucent though the bacon will still be supple and pliable. Remove with a heatproof slotted spoon, allowing excess fat to drain back into the pan before setting the bacon aside. Reserve 2 tablespoons of the pan fat (leave it in the pan) and discard the remaining fat. Add the onions to the pan and sauté over medium-high heat scraping all the browned bits from the bottom and sides of the pan. Sauté until the onions begin to turn translucent but are not limp. TIP: if you allow the onions to sit before stirring they will pick up more of the pan drippings. Add the carrots, celery, parsley, herbes de Provence, beans and chicken stock; stir to combine. Add the bacon to the pot; stir to combine. Insert the chicken thighs and sausage into the stew so they are covered. In a small bowl combine the bread crumbs and diced garlic. Sprinkle it evenly over the stew. Bake for 1 hour and 15 minutes, periodically pressing the bread crumbs into the stew which will help thicken it. Place the stew underneath the broiler to slightly brown the top crumbs and remove from oven. Allow to sit for a few minutes, cut sausages into 2 inch pieces stirring them back into the stew, and serve. The stew is even more flavorful the second day too! *Duck fat may be purchased from gourmet or specialty food stores, or online (I bought mine from Amazon.com). It lasts a long time and can be a great substitute for sautéing to add different flavor. **I suggest checking with a butcher for garlic sausage (I found some at Whole Foods in the butcher department). If they are not available a kielbasa may be substituted or see what you butcher suggests. 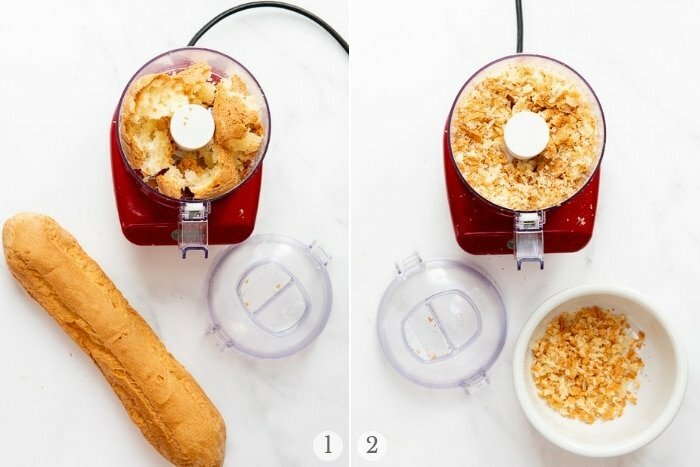 +To make Soft Breadcrumbs place chunks of baguette in food processor, chopper or strong blender and pulse until they form large crumbs. To make the cooking even faster, the vegetables may be prepared the day prior to cooking and stored sealed in the refrigerator until cooking is ready to begin! I’ve never tried this recipe before! It’s perfect for coming cold months of the year and I can’t wait and make it for my husband. Thanks for the step by step even for the homemade breadcrumbs! Ummm this looks delicous. I love all making things in my dutch oven. I never knew you could get duck fat on amazon. I would love to eat this all up! I am so excited for Fall comfort foods! I am adding this to our menu for next week as our temps just dropped SO bad! Now this I have to try! It has so many delicious ingredients! I have never seen anything like that before. I might have to give it a try. OMG that looks SO YUMMY! 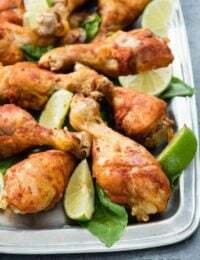 I love that you showed how to pronounce it – I was saying it ALL wrong in my head 🙂 Plus, anything with chicken thighs has my vote! I hate saying things wrong and with words from a different language there is a high chance I’ll do it! I was imagining others might feel the same! There’s so much flavor here I can hardly tell it’s a “shortcut.” So good! That’s great you created a shortcut to this dish because there’s no way I would spend 3 days making any meal. Your recipe sounds like the perfect amount of time and an incredible blend of flavors! I have never tried cassoulet before but I do love a good stew. This looks like it will hit the spot. This dish looks great. A unique dish that would be a hit in our home. I’m excited to make it. I feel like this would warm me right up. I’m liking that you’ve simplified the recipe so more people can give it a shot! 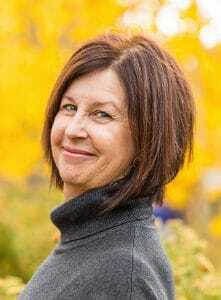 Maybe I’m imagining everyone is like me: no time but likes good food! I need it fast and easy. 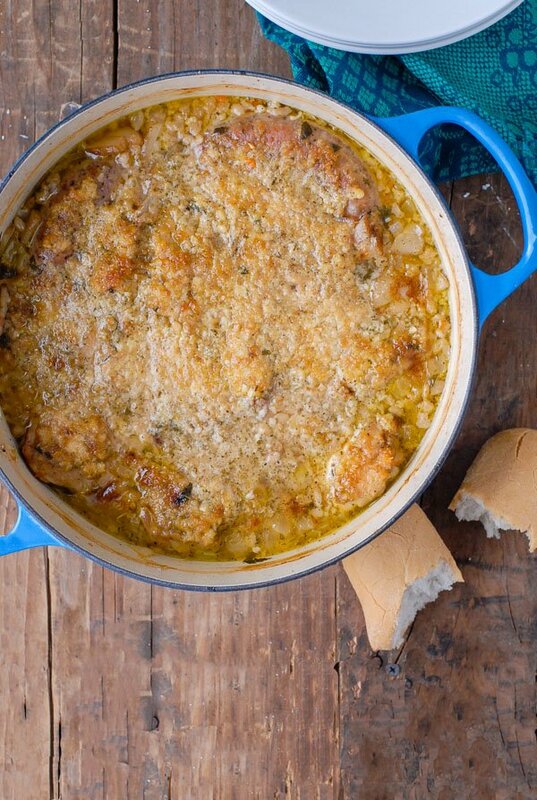 There is definitely a chill in the air and your easier French cassoulet makes one terrific meal! Thanks for your shortcut version! Yes, the fall air is finally here! I would so love to try this! I love that it is shortcut too! This is such a hearty soup, it’s perfect for those cold months where you just want to stay indoors. I’d never heard of this dish before today! It’s actually more of a thick stew. Very filling and delicious! 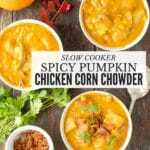 This sounds so flavorful and perfect for fall! It’s like a big, warm hug for your stomach! I LOVE that description Demeter! Perfect. 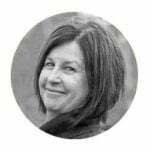 I love coming here to see what you’ve been up to and all the yummy recipes you make. I’ve never used duck fat – that’s new to me. I’ll have to check into that. Thanks!! This recipe is to die for! I need to make this soup! It’s making me hungry just looking at it and I needed some good ideas for dinner. I will definitely try this. WOW! What a thorough recipe. Learned so much.. I had no idea what cassoulet meant.. Thanks for sharing your knowledge. Everything in this soup is something I love. 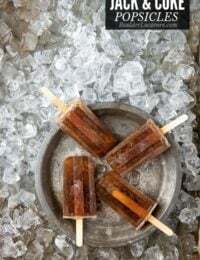 I have to make this now that the weather is gearing up to turn cooler. I mean, come on… BACON. Perfect comfort food for chilly weather! Now that the weather is getting cooler, I am all about stews and soups. This sounds so good. I am going to give this recipe a go. 🙂 My family loves one pot dinners and there is nothing better than dipping a chewy bread into a succulent broth. Our seasonal favorite this year is Salvadorian Beef Soup. We used to make it using ox tails and then the grocers decided that the tail was a delicacy and now we make it using cheap cuts of beef (shank) & large chunks of yucca, green beans, coyote squash, cabbage, fresh spinach & cilantro & lime. Yummmmm, one of the best chill fighters around. Thanks for this. I love cassoulet, tho’ I’ve never had it in a French farmhouse. Years ago, three journalist friends and I drove from a ski resort in the Spanish Pyrenees to Barcelona via France, because the one who had a rental car wanted to visit Carcassone. The rest of hadn’t been there either. It was a dismal day of bone-chilling cold and heavy rain. Most businesses hadn’t bothered to open, but we did find a restaurant whose specialty was cassoulet. I know it wasn’t the best version on the planet, but it was hot and tasty and filling. 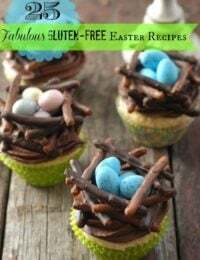 I’ve been wanting to make it every since, but most recipes are too complicated. Julia Child’s version with pork, lamb and sausage (but no duck) runs to 4 pages. I won’t try hers, but I will make yours.